The humpback whales’ most loved vacation spot is Byron Bay Whale watching. On sheltered, calm waters this haven is where the whales congregate each year during the months of August, September and October after their long journey travelling along the east coast of the land down under. Whale watching cruises offer exciting, unparalleled opportunities to discover these gentle giants for yourself. Their utter strength and size will amaze you. Observe them tantalizingly close by as they wrestle, roll, breach and wallow, spy hop and pec slap. 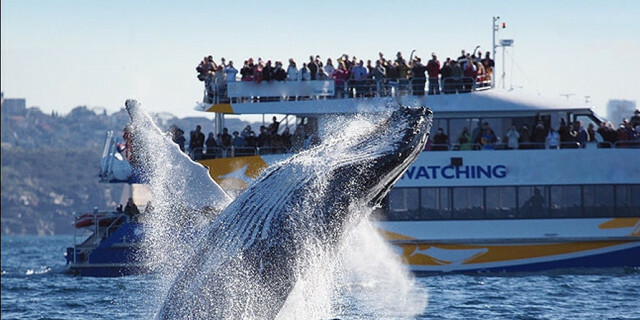 When you are making a booking, why not choose a whale watching cruise on a boat that offers multiple viewing deck levels, both above and below the waterline. Some boats have up to five decks. This will allow you to traverse the vessel to uncover many vantage points to photograph or video these creatures as they play. You’ll be amazed to watch the whales swim back and forth beneath you as though they are toying with you. Some boats have fantastic features like underwater rooms with viewing windows. These rooms are extra-large and can be found in each boat’s hull. As you peer through the windows of the watery deep, the humpbacks’ world will be revealed. The curious nature of humpback whales beckons them to swim alongside the vessel’s windows and have a peek inside. Are you watching them? Or are they watching you? Waterline viewing platforms are another feature some vessels include for close-up encounters. So if you’d like an opportunity to meet a friendly whale face-to-face, the operator can lower you down to the waterline on a platform. How thrilling to be just feet away from the largest of earth’s magnificent creatures! You will surely be tempted to reach out and touch a whale there and then. And of course you’ll need to select an operator whose vessel is built for speed. A fast boat means less travelling time to reach the whales and more time for you to spend interacting with them. So as you speed along, a comfortable boat will further enhance this memorable experience. Capping off the experience is a friendly crew who offer a wealth of knowledge and experience to make your whale watching cruise a fun, enjoyable and educational adventure suitable for all ages. Now that you know how to select the best whale watching cruise, why not make a booking and discover these beautiful humpback whales for yourself. You won’t be disappointed!